The 2019 DBM Australian Financial Awards were presented in Sydney on Wednesday, 27 February, recognising the best of the Australian financial sector as chosen by over 80,000 of its retail and business customers. The awards are based entirely on customer feedback and ratings of their own financial providers throughout 2018. In Business Banking, Bendigo Bank was a big winner on the day, taking home 5 awards including the prestigious Most Recommended Business Bank. In Retail Banking, Greater Bank was the Most Recommended Customer-owned Bank while ING was the Most Recommended Bank overall. Among the major bank category, NAB finished with 4 retail banking awards including the coveted Most Recommended Major Bank prize as well as one business banking accolade. 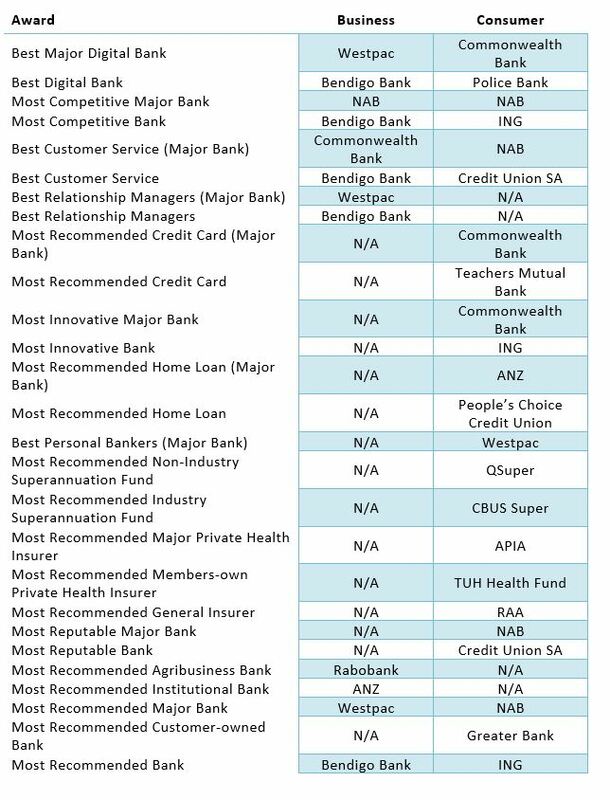 CBA took home 4 awards across both business and consumer categories including the Most Innovative Major Bank, while Westpac won 3 for business banking one of which being the prestigious Most Recommended Major Business Bank. ANZ meanwhile became Australia’s Most Recommended Institutional Bank and was recognised for offering the Most Recommended Home Loan for a major bank. Rabobank became Australia’s Most Recommended Agribusiness Bank, while RAA won the Most Recommended General Insurer. Across superannuation and health insurance, QSuper was the Most Recommended Non-Industry Superannuation fund, while CBUS Super claimed the Industry Superannuation fund category. TUH Health Fund was the Most Recommended Members-own Private Health Insurer. The winners of the above awards (and more below) were selected using Consumer Atlas and The Business Financial Services Monitor (BFSM). Collecting feedback from over 80,000 Australian financial customers across both retail and business categories, these programs are the largest and most comprehensive financial customer research surveys in Australia. View the full list of award winners below.